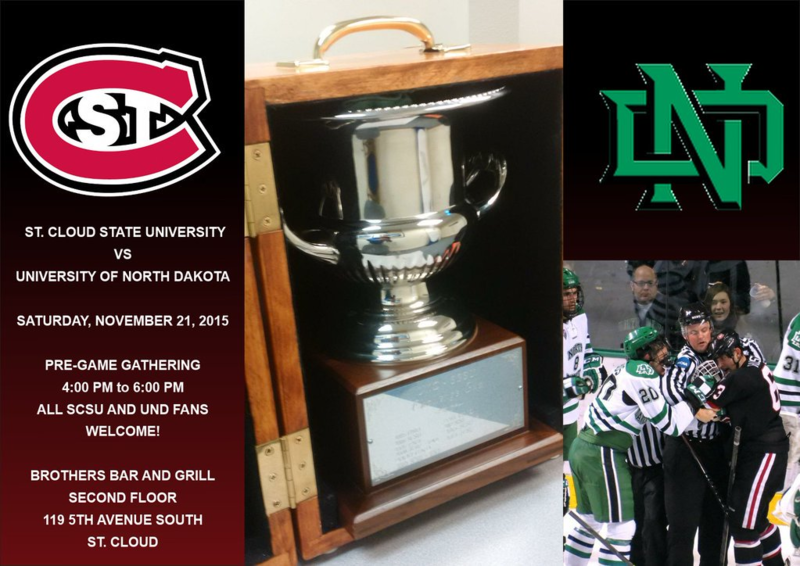 Please join us for the UND/SCSU pregame social, an event which takes place in both Grand Forks, North Dakota and St. Cloud, Minnesota each hockey season. This is an opportunity for fans of the University of North Dakota and St. 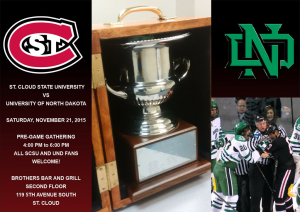 Cloud State University to gather, celebrate the great sport of hockey, and view the Challenge Cup, a traveling trophy which is presented to the team that wins the regular season series. North Dakota claimed the Cup last season with a record of 3-1 against SCSU, outscoring the Huskies 10-8 in the four contests. The teams also met twice in the postseason. St. Cloud State bested UND 3-1 in the NCHC semifinals, while the Green and White earned revenge eight days later with a 4-1 victory in the NCAA West Regional final. The pregame event will be held on Saturday, November 21st from 4:00 p.m. to 6:00 p.m. on the second floor of Brothers Bar & Grill (the same location as the past two years). The address is 119 Fifth Avenue South in St. Cloud, within walking distance of the Kelly Inn. The event is free and open to the public. A free appetizer bar will be available, and everyone in attendance will have the opportunity to win door prizes. Fans of both teams enjoy the camaraderie at these social events and regularly comment that the connection between the two fan bases is among the best in college hockey. Mark your calendars and join us for this event!